Scientists add a peephole to Schrödinger’s box « Adafruit Industries – Makers, hackers, artists, designers and engineers! National Monitor has the story about a new direct measurement process that will allow physicists to measure quantum states quickly and accurately. Scientists at the University of Rochester have begun to apply a faster, single-experiment measurement process to multidimensional quantum states known as direct measurement. Previously, measuring a 27-dimension quantum state required a costly, time consuming process called quantum tomography that was akin to creating a 3D image from many 2D images. The genius of direct measurement lies in its two-stage measuring process. Typically, measuring a quantum state changes it irreversibly. For the first, or “weak” stage of the direct measurement process, scientists measure the state so gently that the system is only slightly altered and doesn’t result in the collapse of the wavefunction. Because it remains intact, this allows a subsequent, or “strong” measurement of the other variable. 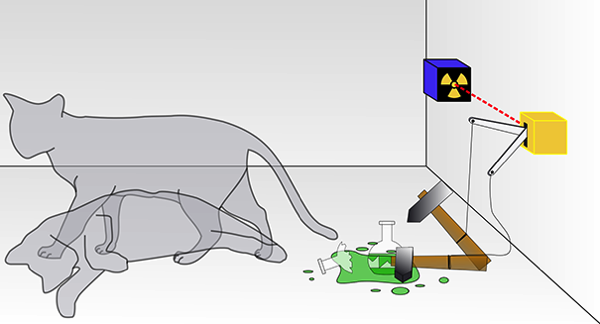 “Schrödinger’s cat” is a thought experiment, sometimes described as a paradox, devised by Erwin Schrödinger in 1935. It illustrates what he saw as the problem of the Copenhagen interpretation of quantum mechanics applied to everyday objects. The scenario presents a cat that may be both alive and dead, depending on an earlier random event. Although the experiment was never meant to be taken literally, similar principles have been researched and used in practical applications.